Alain Cardan is a fearless space pilot in a near future when Earth begins the colonization of the planets of the solar system and launches an expedition to another star. 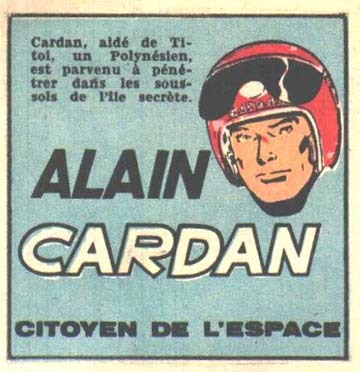 Alain Cardan was originally serialized in Risque-Tout and Spirou from 1956 to 1960. 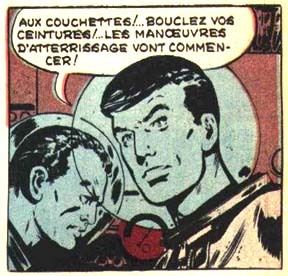 The stories were not collected in the graphic novel format. 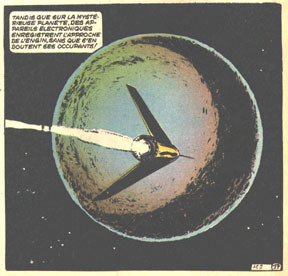 A fan-produced edition entitled L'Expédition de la Planète Venus (The Venus Expedition) was published in 1990 by the "Editions de l'Amateur Passionné." FOR MORE ABOUT YVAN DELPORTE, . FOR MORE ABOUT GERALD FORTON, . Alain Cardan © 2002 Delporte/Forton. All rights reserved.